This evening I will take a brief look at the week ahead as our up and down temperature ride continues. Full updates at the normal time make a return tomorrow. A cold front will cross the region tomorrow morning but deep cold air will lag behind a bit thus leading to a pleasant day overall across the area. Highs will range from 30’s in the mountains to 50’s on the coast. Deep cold air moves in for Tuesday and brings fair but chilly weather with sunny skies and highs in the 20’s and 30’s for most areas. NW winds could be biting at times so watch out for windchills. Wednesday brings our next chance for active weather with warm air surging northward once again. With deep cold air in place, expect a period of light snow/sleet/freezing rain/rain across the area Wednesday morning. Highs will range from the 20’s inland to 40’s at the coast. Thursday is our next cool day with highs tumbling back into the 20’s and 30’s under mostly sunny skies. Tuesday looks to be a good analog day for Thursday and thus windchills could be a factor once again. Friday continues the quiet but cold streak Thursday started with highs in the 20’s and 30’s under mostly sunny skies. A few clouds may approach the area in the evening as our next potential storm approaches. Saturday and Sunday are very uncertain at this point. There are indications some sort of precip will impact the area however it is still unclear if this will be rain/snow and even if it will happen at all so stay tuned throughout the week as this becomes more clear. Another update comes tomorrow morning at the usual time. Today, while the weather is cold and quiet, I will take some time to look back on how I did with the forecast for our most recent storm. I will also look back on what I did well and where I went wrong and why. I put this map out 48 hours before the event and stuck with it all the way through. According to the NWS, this is what actually fell. The mixing along the coast that was forecast panned out well. Most coastal areas fell into the higher range of the 3-6″ forecast with interior Casco Bay seeing higher totals, as forecast. 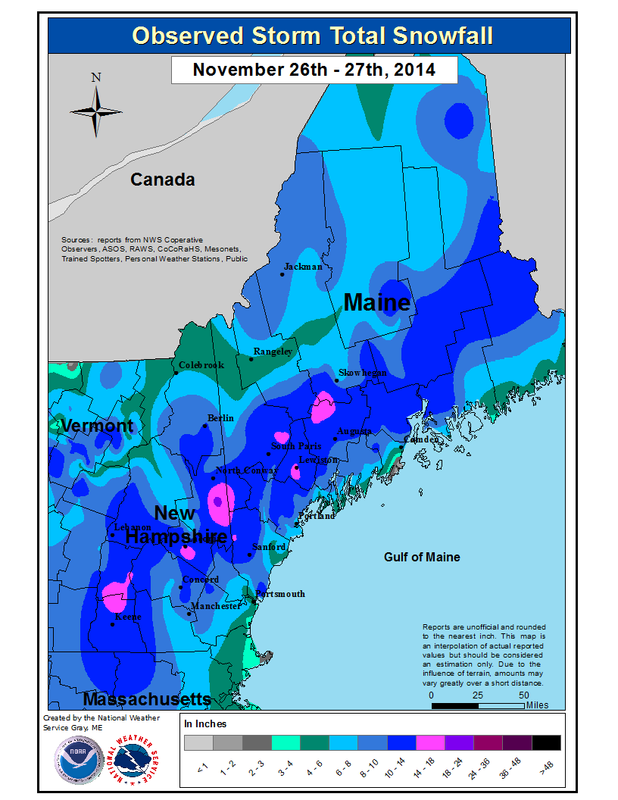 The only area that underperformed at the coast was Rockland where only 2″ fell. The only significant overperformers were in York county where an unexpected 12+” fell. Inland areas lined up very well with the forecast with most areas seeing the 10-14″ forecast. There were a few 15-16″ amounts but overall they were very isolated and most areas verified well. “One thing I should note is the potential for higher amounts in the mountains. Models have pushed the strong frontogenesis band I talked about earlier farther north in recent runs and that could raise snow totals for the ski areas.” From Wednesday Morning’s discussion. Overall, I think the forecast was pretty good for the area. I have isolated the culprit behind the blown mountain forecast, the strong frontogenesis band that the models did show but I did not have enough confidence in to change the map. The one true area of surprise was in York county where nothing pointed to 12″+ amounts, though those did fall. Very strong banding was likely responsible for those totals although more mesoscale influences like terrain or location of measurement could also have played a part. I’ll be back later in the day tomorrow with a look at the week ahead. Brief recap of tomorrow’s forecast: Cold and mainly clear, highs 26-34. Odd timing on this update I know but wanted to bring to your attention the presence of an inverted trough that will bring light snow to the area today. It is currently snowing across southern coastal areas and expect that to continue this morning. 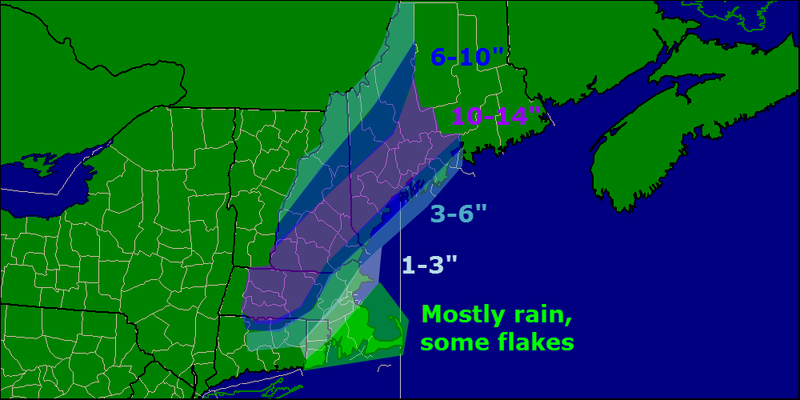 Accumulations shod be in the 1-3″ range and should end by 10am, earlier SW and later NE. After the trough departs, expect partly to mostly sunny skies with temps in the 20’s north, 30’s south. Looking ahead, there are no major storm threats in sight. A warmup of sorts looks to be in the cards for early december. I’ll continue to update daily here but updates may be at odd times. Normal operations resume Monday the 1st. After a few days of much excitement, we can catch a break today with quiet weather. Overall quiet conditions are expected today with mainly clear skies along the coast, and some clouds and flurries possible in the mountains. Highs will be in the 20’s for most, 30’s coast and south. Winds will start out brisk but will diminish as the day goes on. Have a great Thanksgiving everyone! Our long-awaited storm is coming to fruition this morning with heavy rain bands already impacting SE MA. Should you need to travel this morning, do it now as conditions will rapidly deteriorate this afternoon/evening. The forecast timing is mostly intact although precip is arriving a little earlier than expected should that factor into your travel plans. Precip should start as rain for most (even the bullseye areas of Central MA are seeing rain now) but should quickly change to snow once heavier precip and dynamic cooling takes over. One important change from last night is that models are now in almost unanimous agreement on very strong mesoscale banding developing across the region. This is largely due to a very strong strengthening of the thermal gradient with height (frontogenesis). The sensible application to this complex idea is that when you have a lot of frontogenesis, you have a lot of heavy precip. If you want snow that is thumping away and piling up fast, this is what you want to see. Something like this indicates that very strong banding will set up over coastal Maine as well as the foothills of Maine extending down into NH. By this time, temps will be cold enough for all snow, and if for whatever reason they aren’t, this will knock them down pretty quick. On the other hand however, the cold air has been just a hair slower than expected in moving into the region. This leads me to believe that some areas may have a slightly harder time going over to snow, especially along the coast. Due to the harder time changing over and the strong banding signals canceling out, I am inclined to leave my snow forecast intact. Keep in mind, those numbers are a range of estimates. Some areas, especially along the immediate (within a mile or two) may fall into the lower end of the scale. 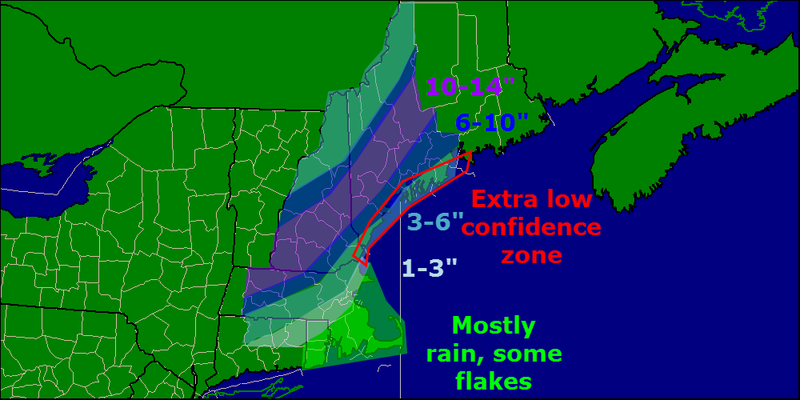 One thing I should note is the potential for higher amounts in the mountains. Models have pushed the strong frontogenesis band I talked about earlier farther north in recent runs and that could raise snow totals for the ski areas. I will have more updates on twitter today and depending on conditions, may or may not have another update here. Next update for sure will be tomorrow morning. Winter storm warnings and winter weather advisories are flying for large parts of the area this evening ahead of a majorly disruptive pre-thanksgiving storm. For more details please visit the NWS website. Last blog update today and we do have some important things to talk about. First off, this is a very hard forecast especially for coastal Maine. Our main problem continues to be a warm layer at roughly the 650mb level (high high up there) that will tamper with the formation of snowflakes. When temperatures are too warm at this level, snowflakes have a hard time forming. this can result in icier snowflakes, or columns as they’re called, falling from the sky. This can be a problem as far as accumulations go because these types of flakes are much harder to accumulate than normal flakes. In addition to our snow growth problem, we have a very warm ground in place from two days in the 60’s which will make accumulations harder. Also, the event will start as a period of rain before changing over to snow which will further warm and thaw the ground. With a warm and wet ground in place to start the event, I can easily see accumulations being cut down especially at the coast. This will also be a very heavy, wet snow so we have basically an anti-fluff factor working against us. With compaction and melting, should the coast flip to rain at some point, I can easily see how you will end up with less snow on your car than you may have seen on a map. For this reason, I have trimmed back totals a little bit at the coast. I think that inland areas should have no problem with snow growth and the snow will be a tad drier there as well. Should temps be a little chillier at 650mb or the switch to snow happen a little faster, coastal areas could pick up more snow. Should a warm layer work in aloft and the coast flips to sleet or columned snowflakes, totals go down. 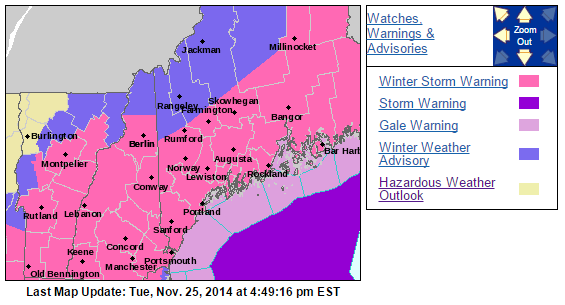 That is why I have highlighted coastal Maine as ‘extra low confidence’. That’s not to say I am super confident about the rest of the area, I just want to put it out there that bust potential is high. I will be back tomorrow morning with another update. This will be a now-casting type of event so I encourage you to follow me on Twitter for the latest updates and forecast tweaks tomorrow as things unfold. In my post earlier today, I went over the timing and impacts in great detail. I will copy and paste that below because it remains unchanged. Wednesday AM: The calm before the storm. Quiet conditions, no travel impacts. Generally cloudy across the area. Wednesday PM: Precip has overtaken all of the area. Snow is falling heavily across interior SNE with rain along the coasts of RI and MA and mixing along the NH coast. Maine is pretty much all snow after this. Heavy snow bands should work their way north during this period. Travel impacts: Moderate to high. Wednesday evening: The height of the storm. Heavy snow is falling over interior SNE with the snow line collapsing towards the coast. Maine is experiencing heavy snow as well. Mixing in NH should change to snow during this time. Cape Ann MA and SE MA remain all rain. Travel impacts: High to very high. Thursday AM: All done. Snow has moved into eastern ME but slick spots will still be around as temps will fall below freezing for everyone. Even those who saw rain could see puddles freeze up. Airports will also be clogged up with delays due to ripple effects from the storm. Travel impacts: Light (still high for airports). Winds gusting over 30mph at times will cause blowing snow and reduced visibilities especially in heavy snow bands. Watch out for harsh road conditions in any of the areas shown in Red, Orange, or Pink in the maps above. While that is just one model, I think it lines up nicely with the forecast. 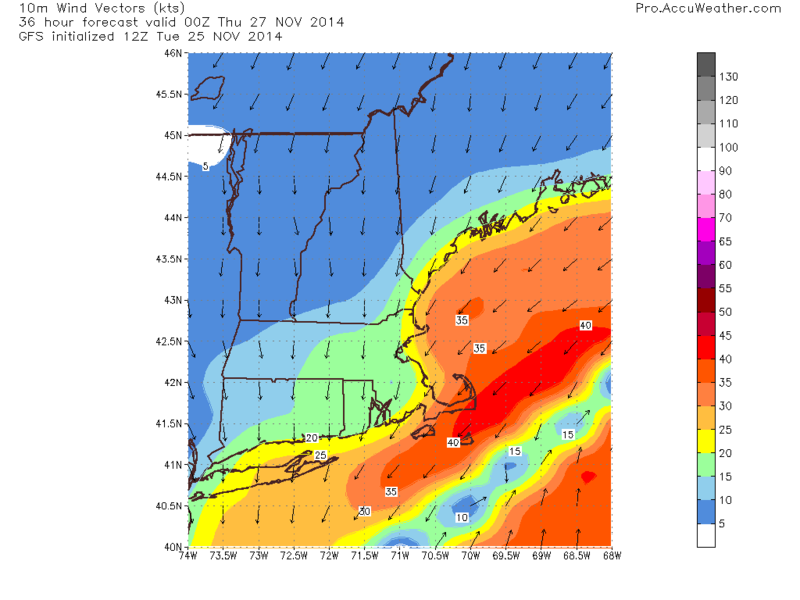 GFS model IDEA on wind speeds for 7 PM Wednesday. Note, speeds in Knots not MPH. Winds will be an issue as well cranking over 30mph at times. This combined with over 6″ of heavy wet snow for lots of areas leads to an enhanced risk for power outages. Busy day in the weather world today as a high-impact storm gets ready to move up the coast on the busiest travel day of the year. Below I will highlight impacts, timing, and what might go wrong and why. All the players are on the field so to speak right now as energy is diving south across the plains (the kicker energy) and more energy is rising up through the GOM. 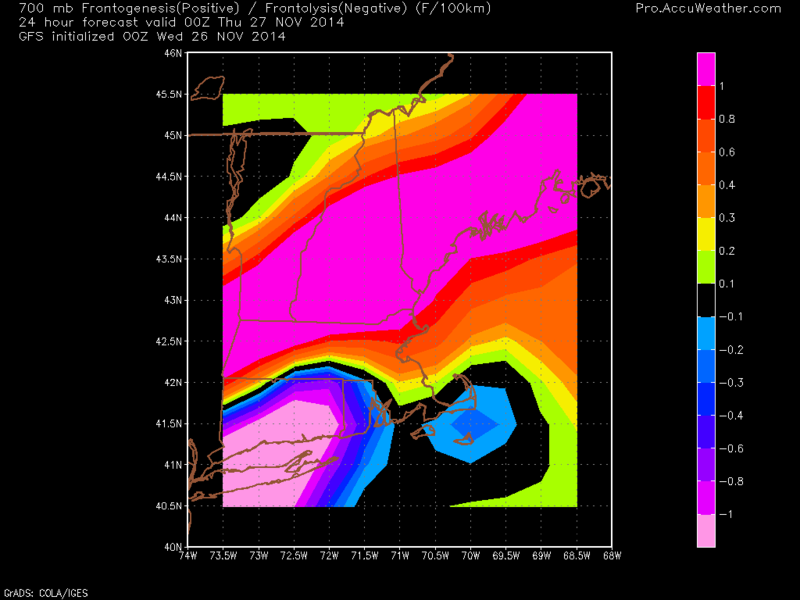 The interaction between these two peices of energy will be key in determining where the heaviest snow sets up. 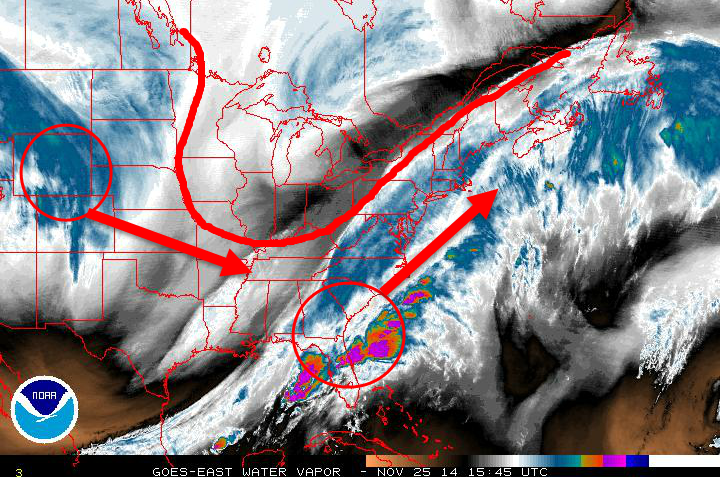 Water Vapor imagery clearly shows our developing storm system over the SE US as well as the energy diving into the plains states that will help to guide the storm up the coast. As confidence has increased regarding moisture/presence of cold air, 10-14″ zone was added. I still think midcoast Maine mixes a little bit and wetter snow overall holds down totals generally along coastal Maine. That being said, I still think that with lots of upward motion and dynamic cooling, the coast can do well in this storm. More updates on Twitter this afternoon @JackSillin and I’ll be back on here with another update this evening.